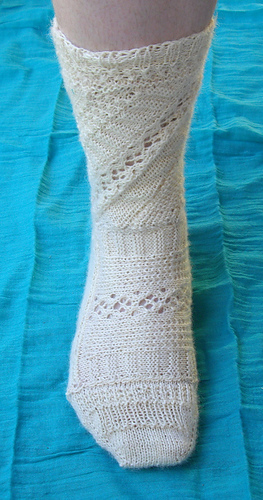 This sock design was a finalist in the Sock Summit 2011 Design for Glory competition. 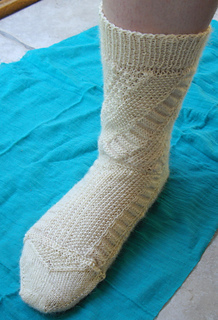 It required that all submitted socks have at least 5 different modules so that all team members in a Fleece to Foot competition could knit simultaneously. The original design was for freshly spun natural-colored yarn, and so involves a lot of textures. Because some of the modules are small, they can be made using leftover yarn from other socks for a very colorful result. There are thousands of sock variants that can be made from this pattern, which is why the socks are Massively Modular. (The pattern is 38 pages long, and includes a page of mathematics to calculate the number of sock variants for each size.) Instructions are given for both toe-up and cuff-down constructions, and every stitch pattern and every multi-stitch structure is given both as charts and as written instructions. There are also prompts given so the pattern can be done as a Choose Your Own Knitventure if desired. 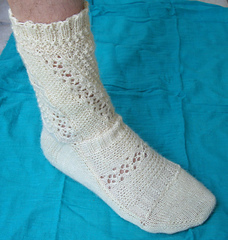 Each sock is knit in at least 10 pieces, most of which are knit flat but some of which are worked in the round. Size M: Foot circumference ~8”, foot length ~9”. Size S: Foot circumference ~7”, foot length ~8.5”. Size L: Foot circumference ~9”, foot length ~10”. 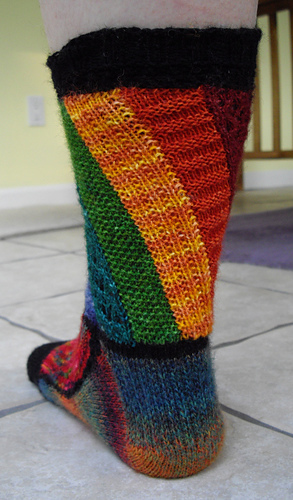 All socks are 7.5”--9.5” tall from floor to cuff-top, depending on the height of leg chosen. Instructions are also provided for customizing the height of the sock. Cast on, knit, purl, make 1, yarnover, knit two together, slip slip knit, 1/1 cabling, grafting (kitchener stitch), invisible seaming, short rows, vertical-to-horizontal grafting/seaming, Judy’s Magic Cast On, Jeny’s Surprisingly Stretchy Bind Off.